I thought I was doing myself a favor the other day when I grabbed a pack of beef jerky for lunch instead of caving to something I know is not on my approved list for foods. But…I looked at the package after congratulating myself on a decent choice and found that it had 6 g of sugar per serving. Seriously! It is meat, unless it’s bacon, it shouldn’t have any sugar! Ugh! So, thinking to myself, I realize that this is something I can do myself. This isn’t rocket science, and I have all the supplies I need in the dehydrator, herbs, spices, etc. On to Google for some research. Firstly, I was disheartened to find that both Alton Brown (2005) and TheKitchn (2009) have the exact same recipe and the one published later does not reference the earlier recipe. Weird and disappointing. I liked the simplicity of the recipe. However, I had just bought tamari and the price of flank steak was four times the price of the top round cutlets, so I decided to tweak the recipe. I know, you’re shocked. 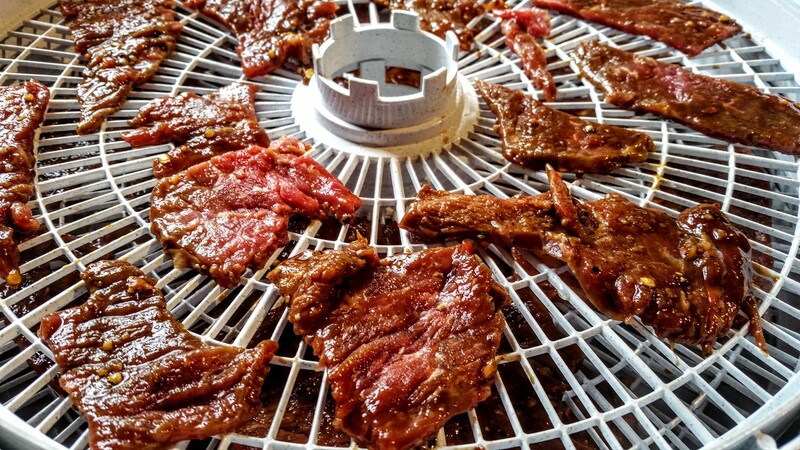 Cut your meat into strips that will be easy to place in the food dehydrator. As I bought the cutlets, they were already very thing, so I didn’t need to use the trick of putting the meat in the freezer for several hours to make it easier to slice. I just cut with the scissors. Place all ingredients in the gallon bag and squish around. Zip the bag closed and let the meat marinate for 2-4 hours. Remove the meat from the bag and allow to drain over the sink in the colander. Place the beef strips on the food dehydrator racks and place at the 160 F setting. Run the dehydrator for around 3 hours and check for doneness. You don’t want to over dry! The finished jerky will be pliable, but not brittle. 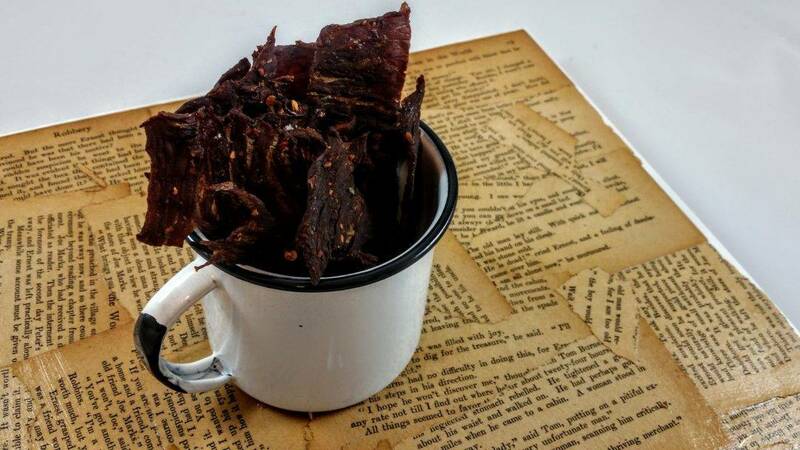 Special note: If there is oil at the top of the jerky, make sure you use a paper towel to blot the oil to prevent rancidity and make sure your jerky lasts as long as possible. Fat goes rancid and that will make you sick, so be sure not to skip this step! So that’s the story. Get jerky!